The ConTEMProof is a rapid deployment roof structure for site services, maintenance, in field fabrication, vehicle storage or office and meeting space. Standard ConTEMProof features Galvalume cladding with gray epoxy coated steel frames. Red shown for product emphasis. Color ConTEMProof available upon request. Powered Structures plug & play lighting and simple connections make deployment and relocation quick and easy. 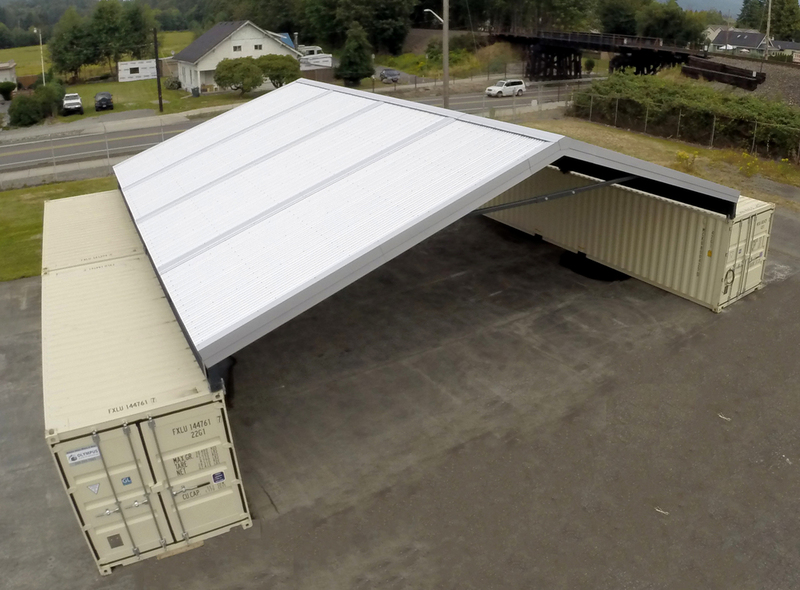 A 24x24 roof system deployable in three configurations to maximize the utility of 20’ containers. Packaged as a single bolted unit for intermodal transport by container chassis or top load for ocean shipment. Provides a 4’ overhang at container doors for dry access when installed over container ends. Units may be installed front to front or back to back to create longer structures.